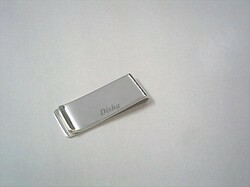 we manufacture money clips in sterling silver. it weighs 20 grams. They are supplied to importers and wholesalers across the globe. The goodwill we have gained in the market is due to our offered Silver Money Clip that are available in the market in numerous sizes, designs and specifications. These clips are manufactured by using optimum quality silver and the latest techniques by our qualified professionals. In order to ensure quality of these clips, our quality controllers test them against various parameters. Along with that, our precious patrons can take these clips from us at market friendly prices. We are offering customized products. 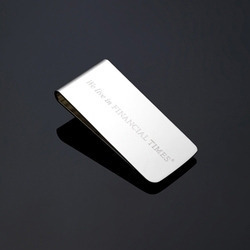 We offer Silver Plated Money Clips to our valuable clients. A nice and perfect gift for every person or relation at any occasions or event. The recepient will never forget in his or her life of this valuable gift because for whole life his money is safe with this money clip. We are offering customized products. With the extensive knowledge and experience in this respective domain we are engaged in offering high quality Sterling Silver Plated Money Clips. Our clips are made up of high quality silver and innovative techniques in compliance with industry standards. Clients can avail these offered clips from us at a reasonable price. Furthermore, the provided clips are available in different customized solutions and patterns as per the requirements of our clients. We are offering customized products. With the constant support of our dexterous crew of professionals, we are fulfilling the varied requirements of clients by offering optimum quality Sterling Silver Money Clips that are used to put all kinds of cards and money in an organized way. The clips offered by us are manufactured using well tested silver and advanced technology. Moreover, these clips can be available in different designs and patterns as per the latest trends of the market. We provide these clips in varied customized options, as per the needs of our clients and at an affordable price. We are offering customized products.